“Preparing children for success in school is the best gift we can give them,” is the motto for New Dimensions Learning Center in Jacksonville, Florida. “As a center, we strive to provide as much education to our families in all aspects of early childhood education, however the nutritional information has always been a weaker point,” says center Director Kenyatta Jelks. She decided to make changes in the center. Creating healthier menus, building a garden, implementing nutrition into daily lesson plans and getting parents involved were a few strategies that she used to enhance her program. When creating the new menus, it was important for Jelks to find innovative ways to introduce children to healthier foods. As a program, they built a garden to teach them about gardening and new foods. “Our children have taken pride in planting their gardens and eating the vegetables that they have grown themselves,” Jelks states. The staff also included new foods in their daily lessons by charting and discussing “go, slow, whoa” foods. This allowed the children to identify foods that are healthy. Parents have become increasingly interested in the growth and the development of the gardening project. The parents get the opportunity to see what their children are learning about nutrition and encourage them to try new foods at home. “If we had to sum up the program changes in one word, it would be ‘illuminating’,” says Jelks. 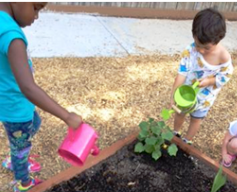 Farm to Child Care is taking root in Texas, thanks to USDA’s Food and Nutrition Service (FNS) Child Care Wellness Grants. A portion of funding went toward establishing Farm to Child Care (FTC) initiatives in centers and day care homes across the state. In 2001, there were six Farm to School programs in the United States. Today, there are Farm to School programs in all 50 states and in more than 9,000 schools. Farm to School programming can make positive impacts when it comes to children’s health.